Provide water year-round – A simple birdbath is a great start. Change water every 2-3 days in summer and use a heater in the winter. Place the water container about 10 feet from dense shrubs or other cover that predators may use. Install native plants – Select a variety of native plants to offer year-round food in the form of seeds, berries, nuts, and nectar. Try to recreate the plant ecosystem native to your area. Evergreen trees and shrubs provide excellent cover through all seasons, The Lady Bird Johnson Wildflower Center as well as the St Louis Audubon Society has lists of recommended native plants by region and state. Eliminate insecticides in your yard – Insects are the primary source of food for many bird species and are an important source of protein and fats for growing juvenile birds. Keep dead trees – Dead trees provide cavity-dwelling places for birds to raise young and as a source to collect insects for food. Many species will also seek shelter from bad weather inside these hollowed out trees. 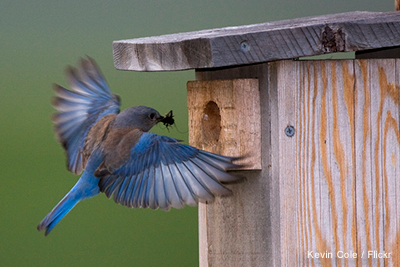 Put out nesting boxes – Make sure the boxes have ventilation holes at the top and drainage holes below. Do not use a box with a perch, as house sparrows are known to sit on a nesting box perch and peck at other birds using the nesting box. Be sure to monitor the boxes for invasive animal species known to harm or out compete native species. Build a brush pile in a corner of your yard – Start with larger logs and top with smaller branches. Some birds will hunt, roost or even nest in brush piles. Offer food in feeders – Bird feeders are great sources of supplemental food during times of food scarcity, and also enhance bird viewing opportunities. Winter time is beneficial for this as natural sources of pods and seeds become scarce. Remove invasive plants from your wildlife habitat – Many invasive plants out-compete the native species favored by birds, insects and other wildlife. Check with your local U.S. Department of Agriculture Cooperative Extension System office for information on plant species to avoid. Reduce your lawn area – Lawns have little value to birds or other wildlife, and they require more energy for mowing, applying fertilizers and watering.